Carson Wentz had a good rookie season, and he’s been playing great so far in his second year, but last night felt like a turning point. Maybe people put too much stock into players having big performances in nationally televised games—Doing It On The Big Stage, as it were—but Wentz looked like a superstar and maybe even an MVP candidate last night. Think of how many bad quarterbacks you’ve seen over- or under-throw passes that didn’t come with even half the degree of difficulty on that throw. According to NFL.com’s Matt Harmon, Wentz’s ball traveled 62.8 yards in the air, making it the longest of any pass over the last two seasons. 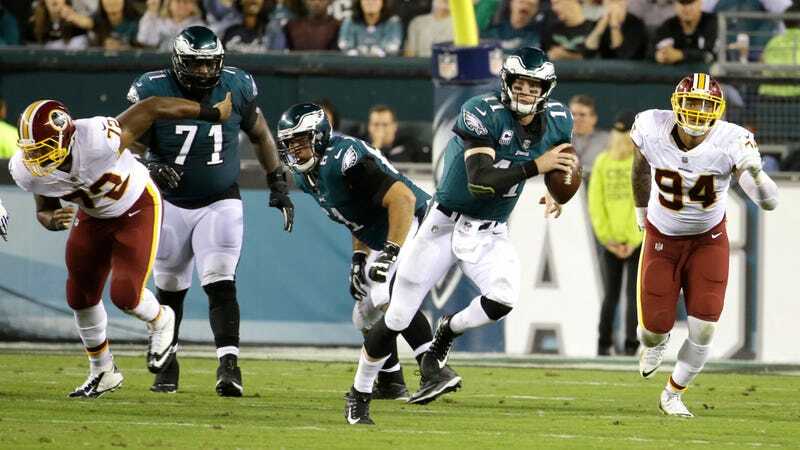 These are the type of throws that separate a good quarterback from a great one, and that have helped turn an Eagles team nobody expected too much from into the best team in the NFC. They’re the kind of throws that—if you’ll allow me to get way ahead of myself for a moment—will be included in retrospective highlight reels after Wentz retires an Eagles legend.